It was swimming night tonight for my boys. It used to be a half hour of sitting pool side breathing in heavy chlorinated air while watching the boys swim laps of the pool but then somehow that changed. Somewhere along the path I must of had a conversation with the head swim teacher about Max's advancement. I think in this little chat, I wasn't really listening.......or it was never mentioned (?) that the next level up for Max was squad and that is another 30 minutes of poolside fun. For the past 3 terms, I have had to coax Max into returning to the pool. It's not that he doesn't like the water, he just isn't really into the lessons (surprise, surprise). In all honesty I wanted the boys to be able to swim confidently so I didn't have to freak out or go into panic attacks every time we were around water and that was it. Squad didn't enter my mind. "Mum, do I have to do squad next term? It's a bit boring.....it's just not really my thing"
Music to my ears! I held back my excitement and did my usual "....are you sure? you might really enjoy it next term?" "I'm soooo hungry, when am I going to eat dinner (whimper, whimper)"
"Where's dad? why isn't he cooking dinner....mummmm what can we eat???" This is when I run a bath and make them wash their hair. Apparently this is a torturous request I ask of the boys, so they sit in their quietly hoping I'll forget they are there. Little do they know I do it simply for some piece and quiet while I make dinner. I had some pasta in the fridge but wasn't sure what to put with it. I picked up the remaining beef mince I had left after making pasties for the weekend and thought I'd be pushing it to feed the four of us. I searched a little more then had an idea. 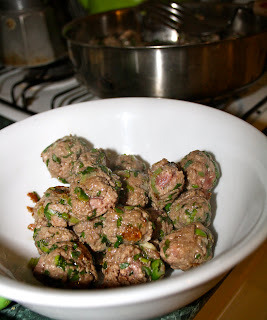 Running with the thought of mini meat balls I pulled out a bunch of basil, spring onions and started chopping. I was delighted with the end result. The cherry tomatoes were a great base to compliment the fresh flavours of spring onion and basil packed into the meatballs. Sweet little tomatoes simmering with garlic...what could be yummier? These would be great on their own as a pre dinner, mezze plate bite or as I did, mixed with ravioli or any type of pasta. Actually, if there were any left over I'm sure the boys would of loved them for lunch in a wrap smothered with hummus and lettuce. Hair was washed (you know I had to use the mummy voice and my eagle eye to get that done), bowls were licked and bellies were full all round. A great idea if you have a little less meat than you would really like. Making the meatballs smaller, makes it look bigger and appeals to big and little mouths- defiantly worth a try, just don't expect leftovers! In a medium bowl mix together beef, spring onions, chopped basil, garam masala and salt and pepper. When very well combined, roll into teaspoon sized balls and put to one side. Heat a large frying pan on high heat. When hot, add oil, swirl around the pan quickly then drop in meat balls and brown. When brown on one side, turn and brown the other. Make sure you do not cook all the way through (see picture to the right). Remove balls from the frying pan and leave to rest. Place frying pan back on the heat and toss in chopped tomatoes with a good pinch of salt. Saute for 2 minutes then add the garlic slices and saute for a further few minutes. Pop in your parmesan rind then place meat balls back in. Turn heat to a low simmer, place a lid on and cook for 15 minutes. After 15 minutes, remove lid, give the pan a little shake to loosen the sauce and cook for a further 5-8 minutes. Remove from heat and serve with pasta or cool and serve as you would like with shaved parmesan cheese. 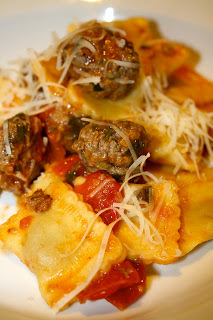 What a great addition to Ravioli! I love these. I don't understand the fuss about bath time, my kiddos will fuss and fight when it is time for a bath then I can't get them out when they are done.